Diana Taylor holds a Postgraduate Diploma in Counselling from the University of Strathclyde (2002) in the Person-centred Approach. Since then, Diana has completed numerous other postgraduate trainings including a specialist in depth training in Somatic Trauma Therapy (2006). She now adopts a more Integrative Approach to her work which draws on other models of therapy including Cognitive Behavioural Therapy (CBT), Attachment Therapy, and Solution Focussed Therapy to name but a few, so therapy can be tailored according to an individual’s needs. Diana has a special interest in the mind – body connection and a deep appreciation of the uniqueness of every individual. She aims to work in a non-judgemental way which offers not only understanding and support but which also enables you to gain new perspectives and/or acceptance. Over the last 15 years, Diana has worked extensively with many people (adolescents and adults) bringing a wide range of issues. In addition to her private practice, Diana has provided counselling/psychotherapy services in a health related setting (with links to the NHS), a community based setting (most referrals from GP’s) and to employees of her local authority via their Occupational Health Department. She also works for a number of Employee Assistance companies throughout the UK providing counselling/psychotherapy services to employees. Her experience also includes supporting people who are recovering from traumatic events as well as providing Critical Incident Response to organisations (on-site). 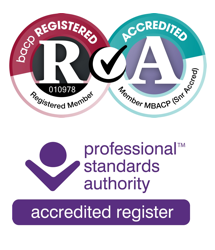 Diana is a Senior Accredited and Registered Member of the British Association for Counselling and Psychotherapy (BACP) and adheres to the BACP Ethical Framework for Good Practice in Counselling and Psychotherapy.